The Nuristani languages are one of the three groups within the Indo-Iranian language family, alongside the much larger Indo-Aryan and Iranian groups. They have approximately 130,000 speakers primarily in eastern Afghanistan and a few adjacent valleys in Khyber Pakhtunkhwa's Chitral District, Pakistan. The region inhabited by the Nuristanis is located in the southern Hindukush mountains, and is drained by Alingar River in the west, Pech River in the center, and Landai Sin and Kunar River in the east. The languages were previously often grouped with Indo-Aryan or Iranian until they were finally classified as forming a third branch in Indo-Iranian. The Nuristani languages were not described in literature until the 19th century. The older name for the region was Kafiristan and the languages were termed Kafiri or Kafiristani, but the terms have been replaced by the present ones since the conversion of the region to Islam in 1896.
it has also been proposed that Nuristani originated within the Iranian sub-group, and was later influenced by an Indo-Aryan language, such as Dardic. The languages are spoken by tribal peoples in an extremely isolated mountainous region of the Hindu Kush, one that has never been subject to any real central authority in modern times. 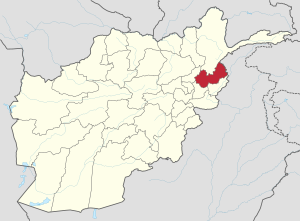 This area is located along the northeastern border of present-day Afghanistan and adjacent portions of the northwest of present-day Pakistan. These languages have not received the attention linguists would like to give them. Considering the very small number of peoples estimated to speak them, they must be considered endangered languages. Many Nuristani people now speak other languages, such as Dari and Pashto (two official languages of Afghanistan) and Chitrali in Pakistan. The earliest divergence of Nuristani from the other Indo-Iranian languages may be indicated by the fact that the Ruki sound law does not apply after *u: e.g. Kam-viri /muˈsə/ 'mouse'. Nuristani shares with Iranian the merger of the plain and breathy voiced consonants, and the fronting of the Proto-Indo-Iranian primary palatal consonants. The latter were retained as dental affricates in Proto-Nuristani, in contrast to simplification to sibilants (in most of Iranian) or interdentals (in Persian). Nuristani is distinguished by the lack of fronting /s/ to /h/ as in Indo-Iranian. Later on *dz has however shifted to /z/ in all Nuristani varieties other than Kam-viri and Tregami. Many Nuristani languages have subject–object–verb (SOV) word order, like most of the other Indo-Iranian languages, and unlike the adjacent Dardic Kashmiri language, which has verb-second word order. ^ Hammarström, Harald; Forkel, Robert; Haspelmath, Martin, eds. (2017). "Nuristani". Glottolog 3.0. Jena, Germany: Max Planck Institute for the Science of Human History. ^ Strand, Richard F. (1973) "Notes on the Nûristânî and Dardic Languages." Journal of the American Oriental Society, 93(3): 297–305.